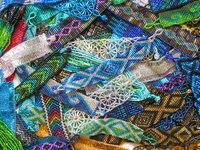 Use a bead loom to inexpensively create intricate, custom-woven bead creations such as jewelry, bookmarks and embellishments. Purchase a ready-to-go loom at your local craft store, or make one yourself and get started on your beading project today. Choose a beading pattern. Count the number of rows in the width of your project. Cut beading thread the length of your project plus 12 inches. Cut one thread for each row, plus one additional thread. For example, if you are weaving a bracelet with nine rows of beading, cut 10 lengths of beading thread. Place the loom across your work surface in front of you. Attach one end of all beading threads to the left base of the loom. Place one thread into each thread guide leaving no spaces. Pull the thread gently taunt and attach the loose ends to the opposite base on the right. These threads are called warp threads. Cut an additional length of beading thread approximately 4 feet long. Lay one end of the thread against a block of beeswax. Hold the thread against the wax with your thumb and pull it over the beeswax to coat the thread. Tie one end to the left edge of the warp thread closest to you, leaving a 6-inch tail. Thread the opposite end onto a beading needle. This is called the weft thread. Lay your pattern in front of you with the image left to right--the same direction as your loom. Place the bottom left bead through the needle and onto the thread according to your pattern. Continue to add the remaining beads for the first row of your pattern onto the thread. Guide the string under the row of warp threads. Lift all beads up--sitting one between each thread space. Hold the beads in place. Bring the needle up and over the last warp thread and sew the weft thread through all beads back to the starting point. Continue with each row in the same manner until you have completed the last row. Work a minimum of 4 inches of the leftover weft thread into your piece by weaving it back into the rows of beads. Trim off any remaining thread. Remove warp threads from the base of the loom. Weave each thread back into the piece--at least 4 inches of thread. Trim any excess thread. Place a drop of fabric glue on each of the thread ends to hold your piece in place. Put the needle through a couple of the beads before threading to test it. Bead holes vary and your needle should not be a tight fit. Choose thread color that matches or coordinates with the bead colors you will use.